Listing Generation System trains real estate listing agents how to find real estate niches with no competition. How to find real estate motivated seller leads. Real Estate Motivated Seller Leads is the best source to get real estate listings. Listing Generation System show you how to identify, understand, and capture motivated seller leads. We will discuss the type of property owners who are most likely to sell, be motivated to sell, and want to sell their property as fast as humanly possible. The most frustrating thing for me was when a property would go up for sale in my service area. Or even worse the homeowner sold their property to an investor in the area for between five thousand and ten thousand dollars just enough money to move out. When the homeowner could have netted fifty thousand or more. There are probably hundreds of real estate motivated sellers leads right in your own back yard. Motivated Real Estate Sellers that are raising their hands to assist them with the sale of their property(ies). You just need to put yourself in the path of success – these sellers become aware of your services. You are the best choice for their real estate listing needs. Listing Generation System is an online real course to coach real estate agents step by step how to find real estate listing niches with no competition. How to find and list real estate motivated seller leads, step by step. Who are Real Estate Motivated Sellers? Divorcing Couples are real estate motivated seller leads, statistics show that one in two marriages will end up in divorce. Seventy Percent (70%) of divorcing couples will have real estate to sell within one to five years after the separation date, but before the finalization of the divorce. Individuals that get ill and are not able to work will be motivated Real Estate Seller leads. Persons that lose their job or are downsized are leads for real estate sales professionals that will be motivated to sell. A homeowner with an IRS lien that encumbers their property(ies) IRC § 6321 and is a very broad lien which includes real estate; it generally encompasses all of the taxpayer’s property or rights to property as security for a tax liability. Real Estates sales agents always ask me how I get real estate motivated seller leads real estate on a consistent basis. While other real estate selling agents are doing what everyone else is doing I am finding real estate listing niches with little or no competition. Prosperous real estate listing professionals consistently do whatever it takes to get motivated seller leads in real estate. Whoever asks me hot to find motivated seller leads I answer by saying do the opposite of what everyone else is doing. I explain they will not find real estate motivated sellers leads by doing what everyone else does. If you are doing the same thing that everyone is doing you are placing ads like everyone else, you are farming to a geographical area like everyone else is, you are marketing to for sale by owner, you are marketing to expired real property home listings. Everyone and his brother in marketing to the same real property owners. If you are doing the same thing that everyone else is doing you are going to have the same result that everyone else is having. If you do things 10% better, you are going to have a 10% better response. Let’s do things that get exponential growth. Motivated home sellers are everywhere. To get motivated sellers you have to optimize your marketing for motivated sellers. When you optimize how to find motivated home sellers you are just making your headline better, you are creating a new marketing piece to finding motivated sellers which ok. Optimizing how to find motivated sellers is good I tell all of my clients that optimization is good, but I explain what I learned from one of the top forward thinkers of the twentieth century. Dr. W. Edwards Deming taught me not only optimization but he taught me innovation. Think of innovative ways to get motivated home seller leads, in the twentieth century professional listing agents must not only have one website that will bring in a consistent flow of motivated seller leads generation website, but two websites that consistently bring in motivated seller leads, or three websites. One for motivated seller websites for low-end homes, another website for real estate motivated seller leads that bring in high-end homes. Breakthroughs and Innovations are the important factor to getting and closing motivated seller leads real estate listings. Click the link below for breakthroughs and innovation in real estate. Success in real estate is your ability to put in place a real estate leads system that is generating a steady stream of motivated seller leads real estate listings. To have real estate success before you can start a real estate listing leads system you need to know where your source of motivated seller leads are at. The best real estate lead system helps you organize tasks, keep track of your progress, and give you information to make decisions and take actions. An excellent real estate seller lead generation system for realtors includes: capture, follow up and convert. I see so many websites that are offering real estate listing services from everything low end motivated sellers, luxury home buyers, real estate investor leads, finding motivated sellers less is more on a website. If a website is about to many things the search engines do not understand what your website is about. The most successful motivated seller websites are about one thing and one thing only. That way the search engines know exactly what your website is about and send you traffic to your website. The most effective way to capture seller leads is through real estate landing pages. See top sample real estate landing pages. Listing Generation System teaches real estate professionals how to optimize and innovate their real estate listing business. 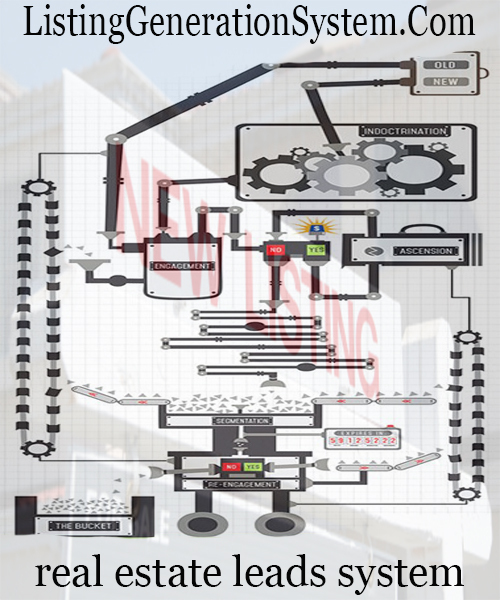 Listing Generation System will teach you how to find the best way to find motivated sellers in your market.